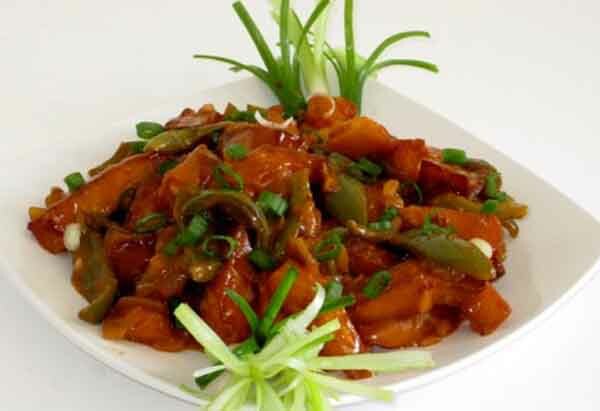 Chilli Potato | Indian Vegetarian Potato Recipes : Chilli Potato is an Indo-Chinese dish and the third most favorite starter in the parties among kids and adults. The recipe is very simple and easy to make. Eating an Indo-Chinese dish outside is definitely not a good option as they use aginomoto in their dishes. You can prepare it at home so that you have control on ingredients which you are going to use. Aginomoto is a type of salt obtained from sodium and amino acid and glutamic acid and most common in Chinese food. So, it is not good for health. In place of aginomoto we are going to use black salt. So let’s start with the amazing Indian starter recipe…. HOW TO MAKE CHILLI POTATO ? Wash all the vegetables and chop them. Peel potatoes and cut them into wedges . Take a bowl and add corn flour to it . Coat potato wedges with corn flour and keep it aside on the plate(You can skip this step). Put the plate in refrigerator for half an hour. Add 4 tbsp oil in a non stick pan. Heat it on medium flame and deep fry the coated potato wedges. Keep flipping the sides until it turn pinkish in color. .
Take out the fried potato wedges from the pan and drain it on the paper towel / kitchen tissue. Keep it aside. Leave remaining oil in the pan. Add finely chopped onions to the pan and simmer it until they are golden brown. Add finely chopped bell pepper. Stir well and cook it until they get half cooked. Meanwhile, take a small bowl and add 3 tbsp corn flour to it add water to it. Mix it well and avoid lumps. Keep it aside. Add 1/2 tsp salt, 1/2 tsp sugar and 1/2 tsp black salt. Mix it and simmer it for 4-5 minutes. Add 1/2 tsp ginger paste and corn flour batter to the pan. Mix it well. Now add 2 finely chopped green chillies, 2 tsp green chilli sauce, 2 tsp soya sauce, 1 tsp red chilli powder and 2 tsp tomato sauce. Mix it well and simmer it for 10-12 minutes. Add fried potato wedges to the pan and mix it well. Simmer it for 4-5 minutes. Preparation : Wash green bell pepper/capsicum and onions(peel off) nicely and chop them into small dices. Wash potatoes, peel and cut them into wedges. Potato Coating :Take a bowl and add corn flour to it . Roll the potato wedges in the corn flour and marinade it and keep it aside on the plate(You can also skip this step). Put the plate in refrigerator for half an hour. Add 4 tbsp oil in a non stick pan. Heat it on medium flame and deep fry the coated potato wedges. Keep flipping the sides until they are golden brown or until potato wedges are tender. It will take 4-5 minutes to deep fry each round of potato wedges. Take out the fried potato wedges from the pan and drain it on the paper towel / kitchen tissue. Keep it aside until required. How to make Sauce : Leave remaining Oil in the pan. Add finely chopped onions to the pan and simmer it until they are golden brown. Add finely chopped green bell pepper/capsicum. Stir well and cook it until they get half cooked. Meanwhile, take a small bowl and add 3 tbsp corn flour to it add water to it. Mix it well without forming lumps. Keep the batter aside. Now, turn the flame to high and add 1/2 tsp salt, 1/2 tsp sugar and 1/2 tsp black salt instead of ajinomoto. Mix it and simmer it for 4-5 minutes. Add 1/2 tsp ginger paste and corn flour batter to the pan(as it thickens the gravy). Mix it well. Sauté for few seconds and add 2 finely chopped green chillies, 2 tsp green chilli sauce,2 tsp soya sauce,1 tsp red chilli powder and 2 tsp tomato sauce. Mix it well and check for salt. If it is too dry, add 1/2 cup of water and toss it. Mix it well and simmer it for 10-12 minutes. Ready For Eat : Add fried potato wedges to the pan and mix it well. Toss them nicely and make sure the potato wedges are coated with the sauce. Make sure not to make it over crowded to avoid it’s getting stick with one another. Simmer it. Remove from heat and serve hot. Chilli Potato is ready to be served. Always serve an Indo-Chinese dish with toothpicks so everyone can help themselves. Also check chilli paneer, chilli gobi. Use black salt instead of ajinomoto. You can also make this recipe without frying potato if you are health conscious. Always use not stick pan while preparing dish with corn flour. You can add honey instead of sugar and it will give its own fantastic flavor. You can also add spring onions to it.